You will be picked up from your hotel in Launceston, or make your own way to the Aboriginal Elders Centre, to be welcomed by a palawa Elder. Enjoy a traditional morning tea after viewing the artefacts and historical photos within the Council centre having been issued with back packs, gaiters and rain jackets, if required. 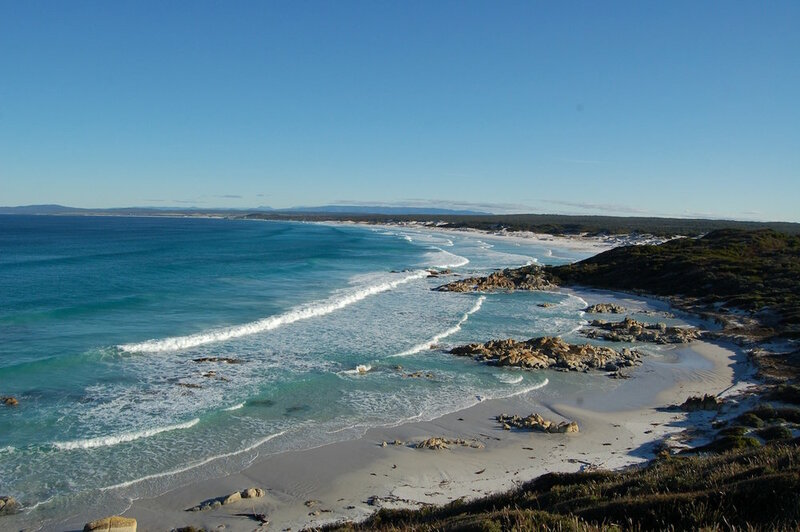 At 09:00 am depart Launceston to enjoy a scenic drive North to the trail head while learning about the Aboriginal and European history of the districts they pass through. The cultural walk begins with a Welcome to Country and a Smoking Ceremony, prior to a guided walk to the summit of wukalina. 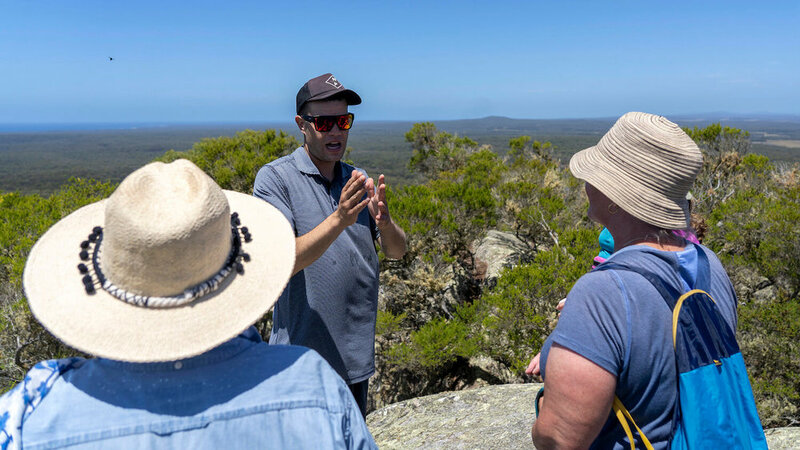 At the summit enjoy a picnic lunch and experience 360 degree views of the magnificent, and culturally significant, landscape laid out all around you. 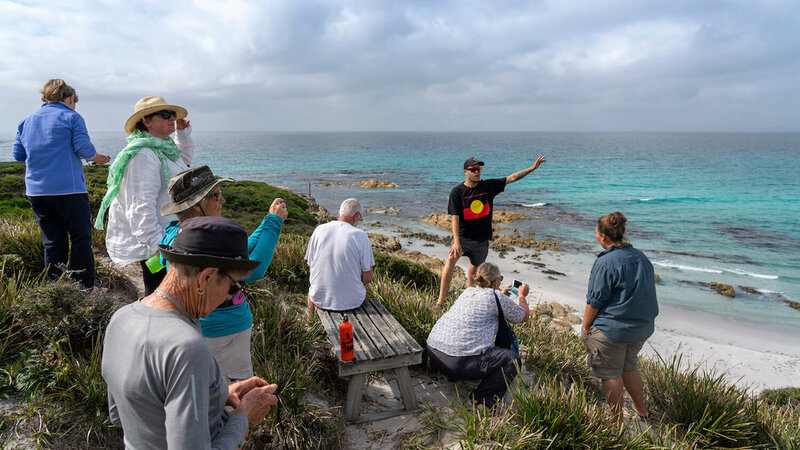 On a clear day truwana (Cape Barren Island) is visible, and you will hear stories of the significance of truwana and other Furneaux Islands - historical and contemporary heartlands of the palawa community and culture. 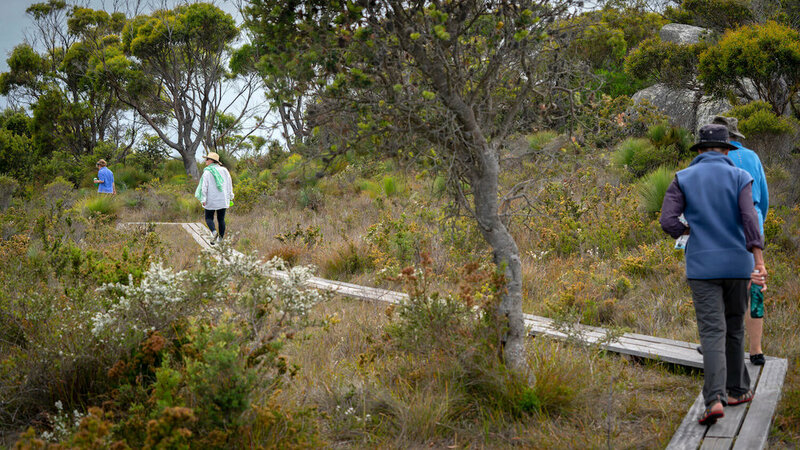 Following lunch, you will be guided along a newly crafted walking track to the purpose built standing camp (krakani lumi), stopping along the way to hear cultural and botanical interpretations from our qualified guides, and potentially spotting one of the vast array of animal and bird species endemic to the area. 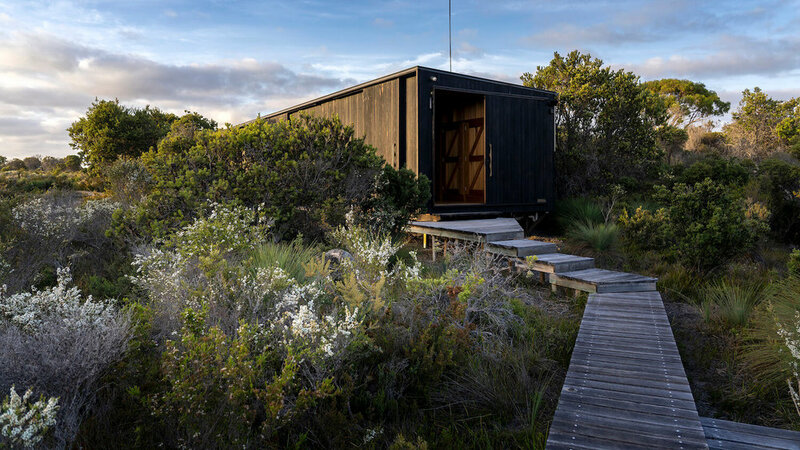 Once you arrive at krakani lumi you can relax in your private hut before regrouping to enjoy pre-dinner drinks, followed by a traditionally inspired Seafood dinner. Evening activities include interaction with a palawa Elder and the telling of the palawa Creation Story. 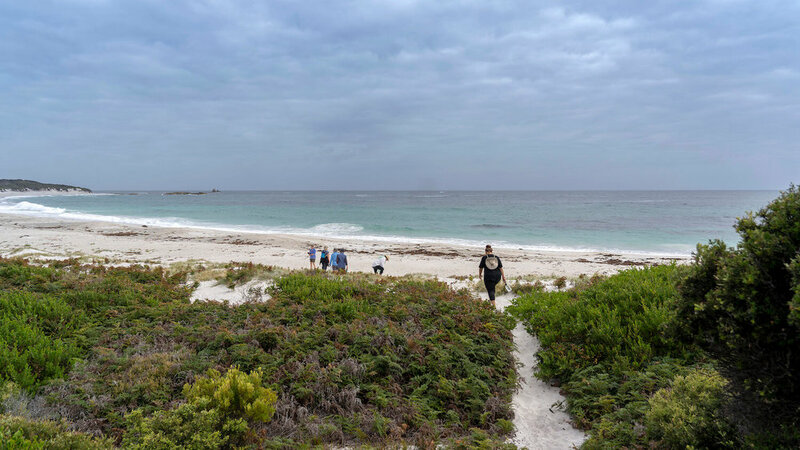 After breakfast you will be guided along a traditional coastal pathway, which includes significant Aboriginal middens. Interpretation will focus on learning about traditional food sources, medicines and native animals. 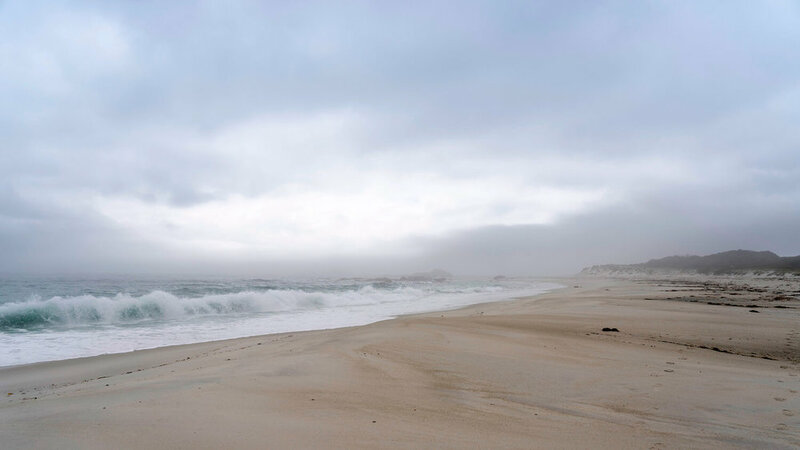 Lunch will be served back at the Standing Camp, following which our guides will lead cultural sessions which include kelp and reed basket making, making and playing clap sticks, and working with shells and native animal furs. 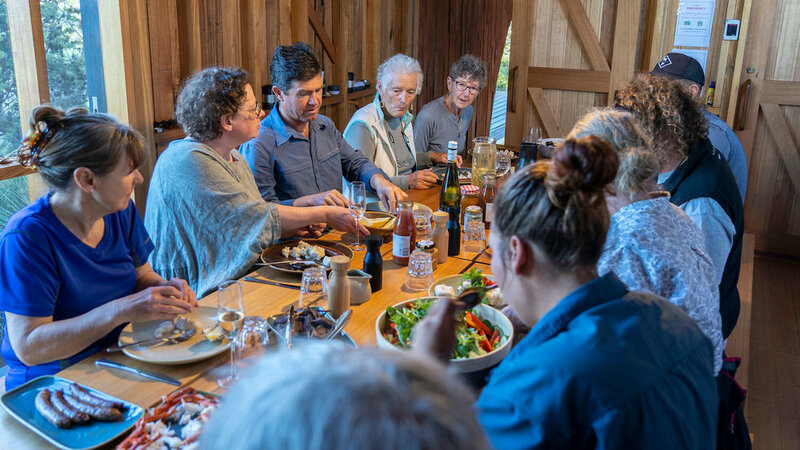 After a traditional dinner including mutton bird, wallaby, and doughboys, guests will enjoy a starlight night walk – where you may encounter native wildlife such as wombats (prupalatina), wallabies (payathanima) and kangaroos, as well as possums and many more of Australia’s famous critters in this untouched landscape. 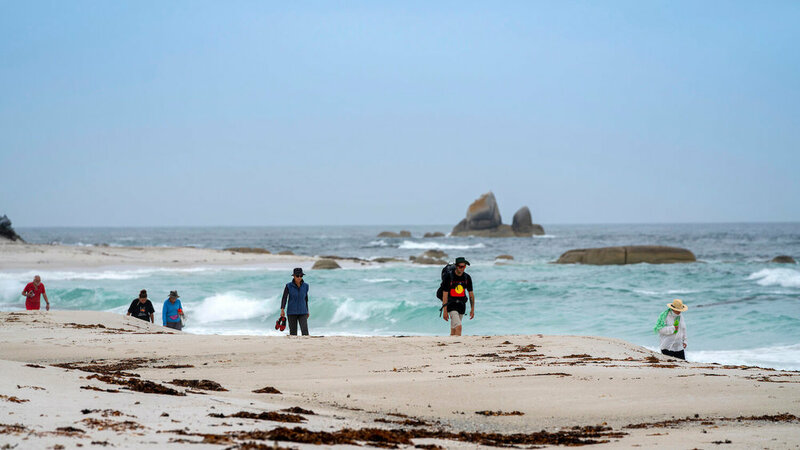 Day 3 comprises of a guided walk south along stretches of pure white sand and past rocky headlands covered in the red lichen typical of the Bay of Fires region. 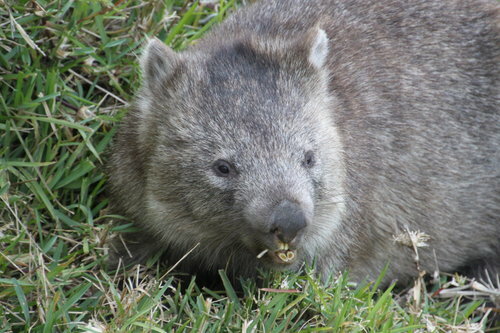 Lunch is enjoyed at the unusual Marsupial Lawns where the chances of spotting a wombat or two are quite high. 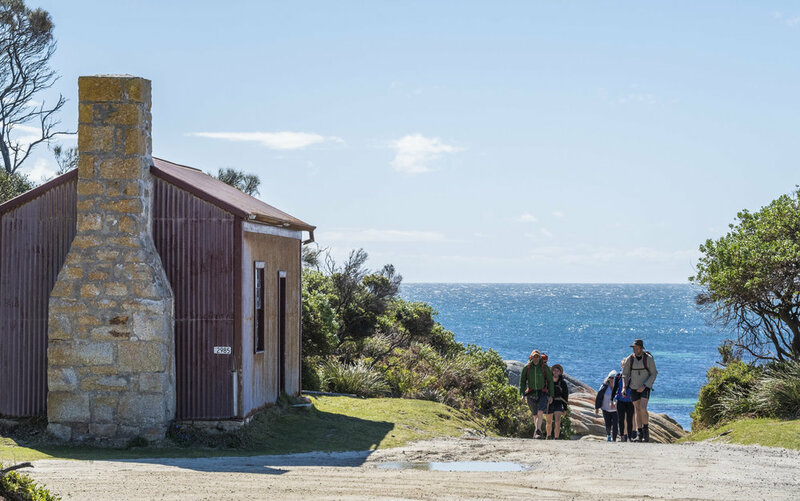 Arrive at the Aboriginal landholding of larapuna (Eddystone Point lighthouse precinct) in the mid afternoon, to one of the most beautifully restored Lighthouse Cottages in Australia. 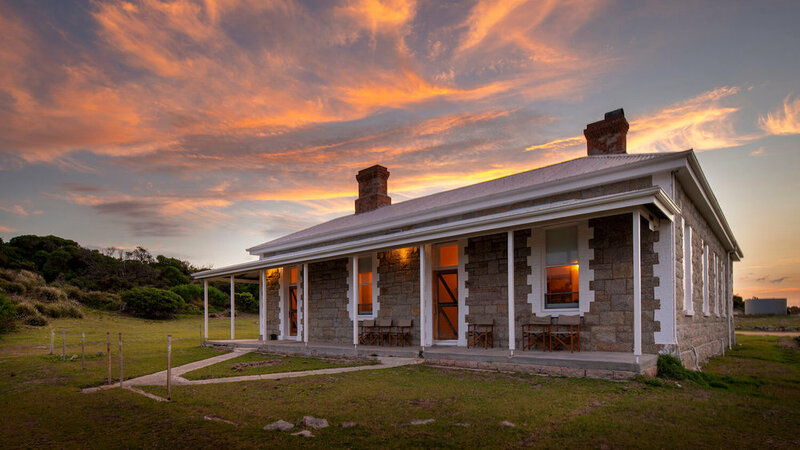 The cottage has been redesigned throughout to provide a purpose built experience for guests, while the beautiful exterior walls of local pink granite have been given new life. 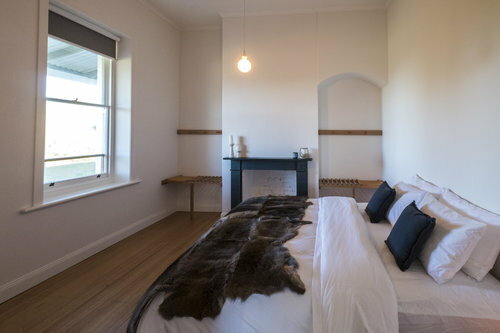 You can then settle into your 'hotel style' room in the Lighthouse Keeper’s cottage, enjoy the lounge and extensive library of reference books, or take a seat on the broad verandah to watch the sun fade into a magnificent sunset. Today provides an opportunity for you to explore the larapuna area – including the coastline, rock quarry and lighthouse precinct. 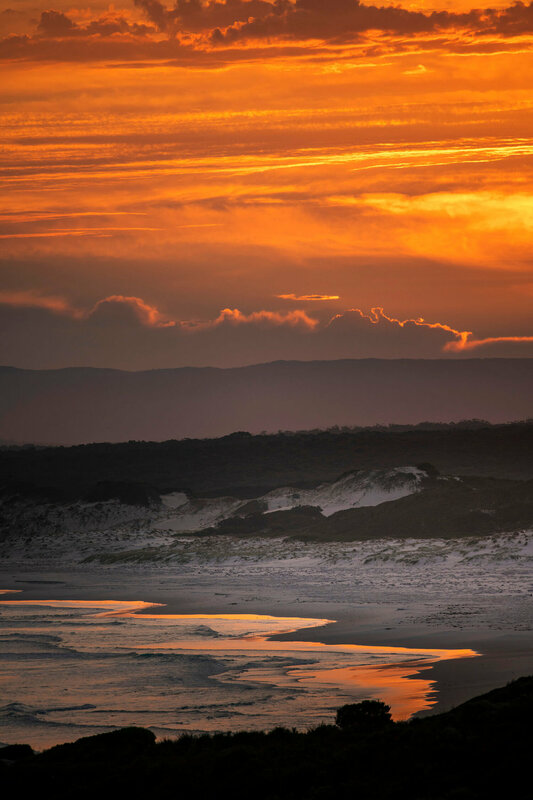 You will be offered a tour of the fully operational lighthouse, with unmatched views of the world-renowned Bay of Fires (larapuna) coastline awaits. 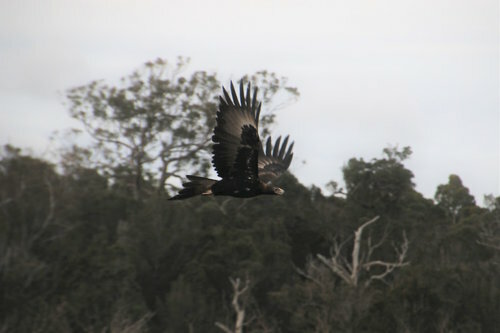 It is not uncommon to see black swans and arctic terns or pelicans, sea eagles, and the odd whale or dolphin in the surf below. 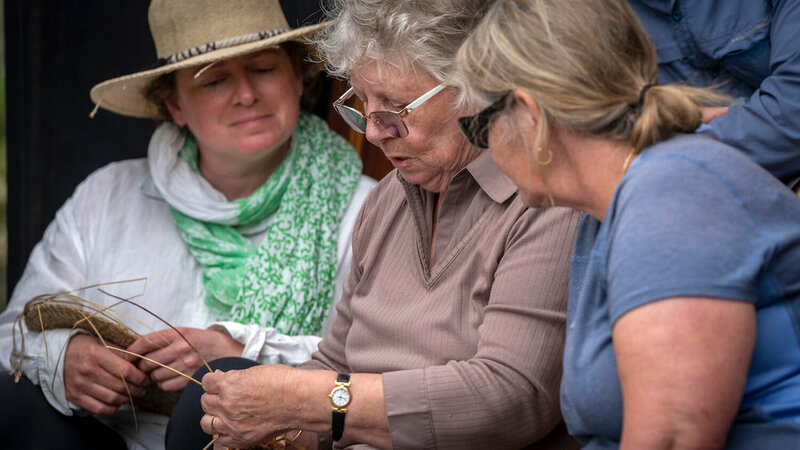 After your tour, you may wish to spend time with our guides reflecting on key learnings from the cultural journey. Lunch is served prior to the drive back to Launceston via a ‘quirky café’ stop in Derby, a little town becoming more famous by the day due to its place on the Mountain Bike ‘map’. 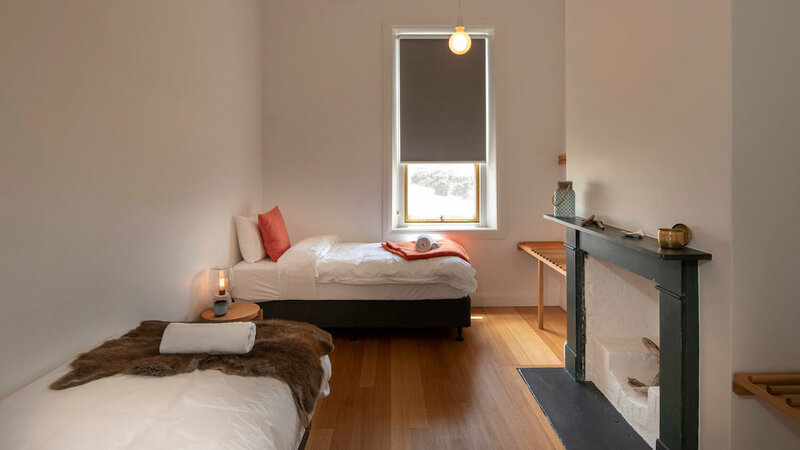 Arrive back into Launceston at approximately 17:00 and enjoy farewell drinks and nibbles, before catching a flight home or settling into one of the city’s many boutique or main stream hotels. Pick up and return from the designated collection and return point(s) in Launceston (see list below). Transport to wukalina/Mt William National Park and return. Twin/Double share accommodation for three nights. Use of 40lt Backpack, Gore-tex jacket, gaiters and a water bottle (if guests elect not to bring their own) for the duration of walk. 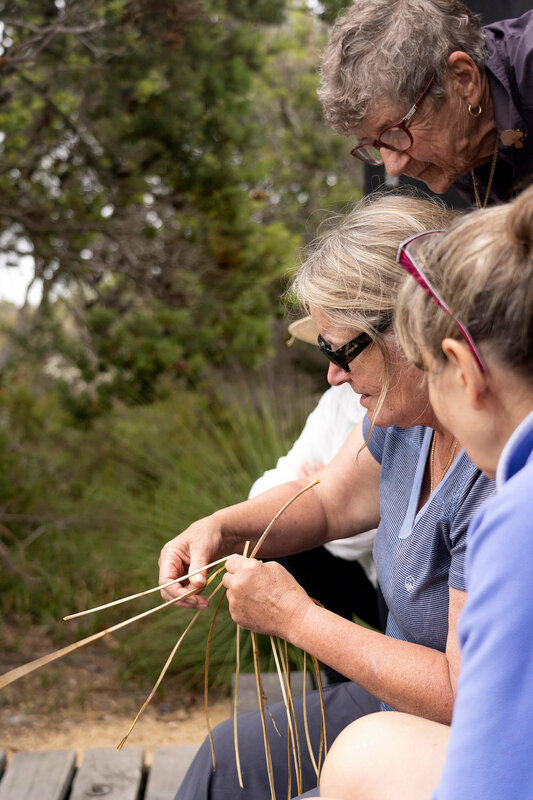 Two qualified guides for groups of 6 guests or more or one guide for groups of 5 or less; as well as interaction with Tasmanian Aboriginal Elder(s) and/or Craftsperson/Artist(s). Complimentary Tasmanian wine/mineral water/juice is offered each night. Note: No price reduction is available for guests who choose not to avail themselves of the alcoholic beverages offered. Single travellers who elect to pay the twin share rate may be required to share with another walker of the same gender. If this occurs a 10 percent reduction on the rate applies. Sole use requests must be made at the time of booking. All other dates from October to April require a minimum of four persons to guarantee departure. Pick-ups are available from the following City hotels in Launceston. The pickup time will be advised at least seven days prior to departure. Depending on the number of pickups booked we may also be able to arrange pickups and drop-offs at Launceston Airport. The Walk departs from the Tasmanian Aboriginal Elders Council of Tasmania Centre at 163 St John Street, Launceston 7250. The Council building is a seven minute walk from the city centre and a 20 minute drive from the Airport in Launceston. We recommend that you arrive the night prior to departure, and that flights are not booked to depart prior to 18:30 on the day of arrival back into Launceston. All guests need to arrive at the Elders Council at 08:00 on Day 1 and can expect to arrive back at the Council by 16:30 on Day 4. A deposit of 25% is required at the time of booking and full payment is due 60 days prior. Full payment is required if the departure date is within 60 days of booking. All prices are quoted per person in AUD including GST and are valid from 1 April 2017 to 31 March 2019. No refund is available after walk has departed. We date the cancellation period from the time we receive written notice from you of a cancellation. Depending on passenger loadings on the date booked, we may transfer the deposit/full payment to a future date (based on availability), within the current or next immediate season, for a nominal administration fee of $50AUD per person, to be deducted from monies held. No refund will be paid for those guests who voluntarily leave the Walk for reasons of bereavement, injury or illness. And they may incur additional costs in the process of our having to repatriate them from the Walk proper. Travel and medical insurance are therefore strongly recommended. In the event we cancel a trip prior to departure or even during the Walk, due to political or natural threats, acts of God and the like (e.g. bushfires, impassable flood waters etc. ), we will fully refund all monies paid for the cost of the Walk only. Any other costs associated with your joining or participating in the Walk will not be covered. Again, Travel Insurance is recommended. In the event we cancel a trip within 30 days of departure or even during the Walk, for reasons other than political or natural threats, acts of God and the like (e.g. bushfires, impassable flood waters etc. ), we will refund all monies paid by you for the cost of the actual Walk, plus any other reasonable directly related travel costs incurred (upon production of receipts), by your wukalina Walk travelling party as booked, up to a maximum of $200.00AUD per person. No compensation applies for our cancellation of departures 46+ days prior to departure. It is the sole responsibility of the walker to personally determine they are medically, and physically, fit to complete the Walk. We ask you not to bring plastic bags and plastic bottles in your luggage – we actively try not to utilise plastic or chemicals across our catering and cleaning regimes, and we ask for your consideration with this. You do not need to bring shampoo or soaps as these items are provided for you - in keeping with the requirements of working within a fragile National Park environment.